The stories for children adopted from Fuling begin here, in a small (by Chinese standards) city along one of the most historic and story-rich rivers in the world. As Fuling becomes more accessible and more adoptees return to visit, the view into this little corner on the Yangtze becomes clearer and at the same time more complex: Fuling is a fascinating, welcoming and changing city. Peter Hessler's book on Fuling. Cook with Fuling picked vegetable. Fuling is situated along the Yangtze River in what until the late 20th century was southern Sichuan Province. Today Fuling belongs to the Chongqing Municipality, an autonomous prefecture apportioned to accommodate the massive Three Gorges Dam Project. This region of China is known for its fertile earth, generous growing season and (until recently) mountainous inaccessibility to the rest of the world. Fuling's story is ancient. 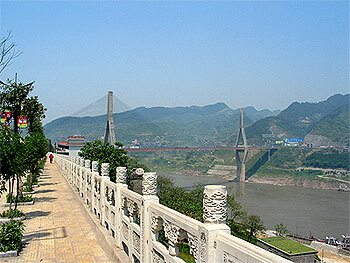 The Wujiang River, which merges with the Yangzte at Fuling, was called "Fu Water." This location was once heavily marked by tombs belonging to the Ba kingdom, which came into existence 4000 years ago. The Chinese word for tomb is "Lingmu." Fu and Ling were eventually joined together to identify this political and cultural center of the Ba. It was formed as the officially recognized "Fu State" in the first year of the Tang Dynasty (CE 618), although there have been people living along the rivers there since the Stone Age. Getting to FuIing has become fast and easy. It used to take eight hours by boat to get to Fuling from the central city of Chongqing; a new highway built in the year 2000 cut the travel time to two hours. 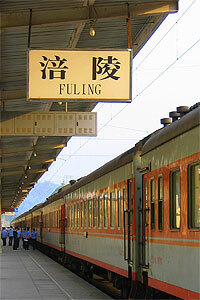 Today a train can get you from Chongqing's North Train Station to Fuling in an hour. Two hundred thousand people live in Fuling proper, although the total population in the area exceeds 2 million--and growing. 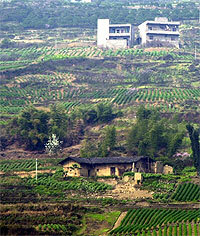 Fuling is surrounded by villages and green mountains. The views on a drive to Fuling are spectacular. Valleys open in breaks between mountains, revealing terraced farms and land that has been tended for centuries. The Yangtze appears and disappears, then seems to widen upon arrival in Fuling. The Three Gorges Dam, miles to the east, has left its mark on the city: a higher river and new concrete levees and walkways. Fuling is quickly urbanizing. While fresh vegetables, fruit and meat can still be bargained for at outdoor markets, slick department stores and modern grocery stores are now within easy walking distance. Luxury hotels have a firm hold in the city as well. Fuling is home to Fuling Teachers College, pharmaceutical manufacturers, and companies packaging the locally grown zhacai, the pickled vegetable that puts Fuling on the mental (and culinary) map for most Chinese people. A city stroll will instantly take you into the vibrant street life Fuling is known for. You'll encounter tea shops, clothing vendors playing mahjong to pass the time, tailors working away on dress orders, and noodle shops steamy from fresh dumplings. By evening, local people come out to dance and eat hot pot or huo guo together. Walking through Fuling is like passing through a friendly gathering on a warm night: the food is good and plentiful and people are happy to sit and chat. 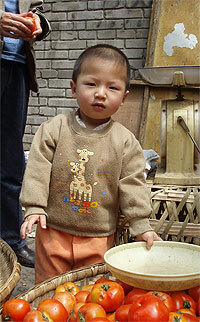 Fuling Kids International is a 501 (c) 3 U.S. registered non-profit organization. Donations are tax-deductible. We are eligible for many company matching fund programs. Check with your employer to see if they can match your donation. Many can!